It will be China vs. Japan for the women’s gold medal on Monday, while Indonesia and Qatar will face off on the men’s top stage on Tuesday. Representing Japan in the women’s final is Miki Ishii and Megumi Murakami, who finished fifth at the 2014 Asian Games and third at the 2016 Asian Championships. Across the net will be China’s Fan Wang and Xinyi Xia. Xia won gold at the 2014 Asian Games and 2016 Asian Championships. Wang finished third at the 2014 Asian Games and was runnerup at the 2017 Asian Championships. Together, the duo earned three silver medals on the FIVB stage in 2018, in Sydney, Lucerne and Nanjing. Ishii/Murakami won their semifinal match against Kazakhstan’s Tatyana Mashkova/Irina Tsimbalova in straight sets, while Wang/Xia outlasted Indonesia’s Dhita Juliana/Putu Dini Jasita Utami 21-10, 17-21, 15-9. The women’s podium matches will be played at 3 p.m. local time (4 a.m. ET) Monday. On the men’s side, Qatar’s Ahmed Janko/Cherif Samba and Indonesia’s Ade Candra Rachmawan/Mohammad Ashfiya will vie for the gold. Janko/Samba topped China’s Peng Gao/Yang Li 21-18, 26-24, while Rachmawan/Mohammad won an all-Indonesian battle with Gilang Ramadhan/Danangsyah Pribadi 21-13, 21-19. Rachmawan already boasts two gold medals from the Asian Beach Games in 2012 and 2014. He and his partner Mohammad won silver at the Satun One Star on the 2018 FIVB Tour. Janko finished fourth at the 2017 Asian Championships, while Samba posted a fifth-place effort. 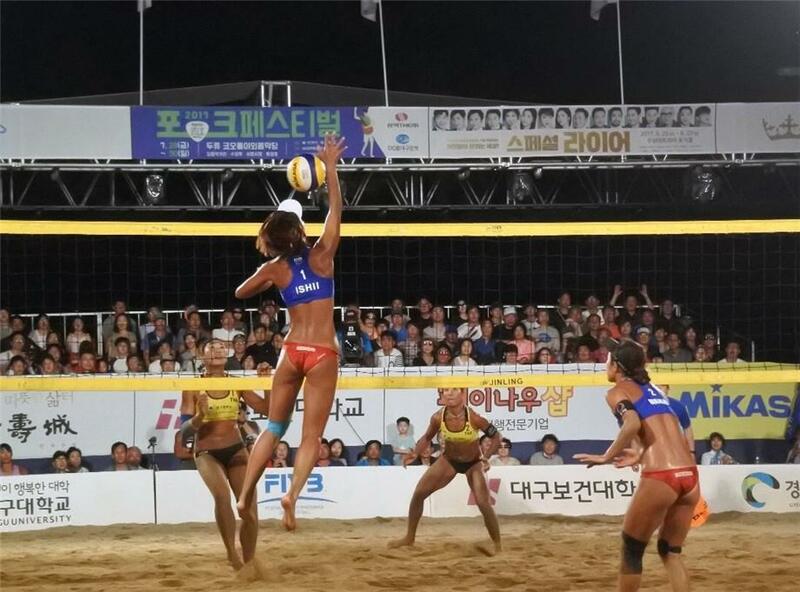 The pair earned two bronze medals on the 2018 FIVB stage. The men’s podium matches are set for Tuesday.